To give your home theater a powerful sound, the RCA RTS7010B 37" Sound Bar with Bluetooth provides the ultimate solution. With its special technology, you can listen to your favorite music as it streams from your smartphone or computer. Each of the four built-in speakers offer impressive stereo sound and a 100Hz to 20Khz frequency response. 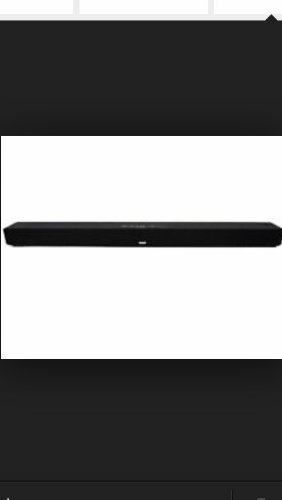 This Bluetooth sound bar makes use of a 3.5mm audio jack, ensuring that it is widely compatible with many different devices. It comes complete with a line-in jack for Apple iPad, iPhone and iPod, but can serve a number of other devices, too. Each home theater sound bar comes with a remote control and wall mount. If you have any questions about this product by RCA, contact us by completing and submitting the form below. If you are looking for a specif part number, please include it with your message. © 2019 - zonita.co.uk. All Rights Reserved.